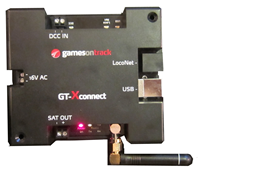 GamesOnTrack GT-position is a new concept for indoor positioning. The concept is based on a combined ultrasound and radio technology using active senders. The concept is designed for very sharp precision, down to 10 mm and designed to scale to large indoor areas using additional satellites. The reason why this concept works lays in our genuine application of the ultrasound and our understanding how to work with reflections and hidden vehicles or objects in a proper way. - It is very accurate and predictable. - It is simple to set up and calibrate. 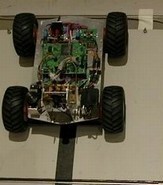 3) The vehicle is positioned with radio controlled ultrasound transmitter. 4) Recievers can be minimum 2 receivers which will work in a one plane scenario. 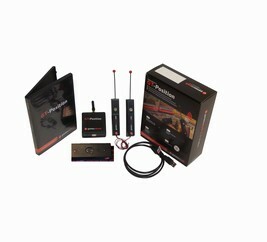 Adding another receiver will enable 3D positioning. The system can be extended with more receivers to cover more space or to enable more details if line of sight is not available. The patent applied technology couples automatically across to best reception. 5) Distance for precise measurement is about 8 m between transmitter and receiver. More receivers can extend the coverage. The system is patent applied by GamesOnTrack A/S. The GT-Position Satellite - also called receiver since it acts as the reception of the distance signal - is operated by simple DC power (14-20 V) the most used power supply is an old lap-top PC charger. It has a consumption of about 40 mA. More satellites can be wired together to be supplied from the same source. Normally satellites are placed high in the room, 2 or 3 together on the ceiling or on walls, often about 2 meter distance between them. We build senders according to demand. Some standard samples are shown below. They can be build in model trains as seen in this example, or they can operate on batteries or Lipos. 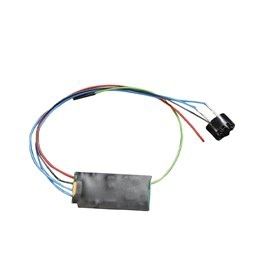 A build in sender uses around 12 mA. 2 AA batteries last more than 100 hours.